which are designed to provide controls to reduce glare and heat but also increase security and privacy. As you shop around for awnings. -A manual crank to open and close the awning or have one that’s completely motorized. -A manual awning uses a crank or handle that a human operator must turn to open and close the awning. 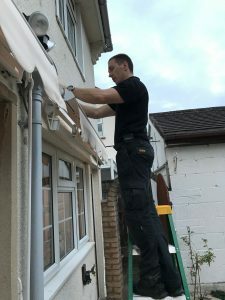 If you are not someone who wants to sit by the awning to open and close it each time, or if you have some limited mobility, you’ll want to consider a motorized awning instead. However, you may be able to save on costs and even have an awning that operates when the power is out if you select a manual awning. – Cost efficiency: An awning is less expensive than a roof. It provides you with shade that blocks UV rays from entering your home, which means cost cuts in utilities as well. 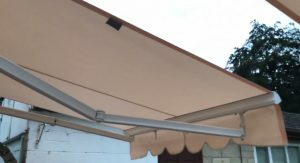 – Ease of use: An awning is easy to extend and retract, it provides great shade, temperature control, and UV protection. Unlike an umbrella it does not have to be changed around frequently as the sun moves. – Added home value: An awning is going to add to your home value because it is both attractive, adding to curb appeal, and functional, extending your living space, and making life comfortable. Each of the above reasons also support the idea of getting a home awning, but they also are valid reasons for getting awning sensors. sends a signal to the motor on the awning to retract it.